Blarney Castle is a medieval stronghold in Blarney, near Cork, Ireland, and the River Martin. Though earlier fortifications were built on the same spot, the current keep was built by the MacCarthy of Muskerry dynasty, a cadet branch of the Kings of Desmond, and dates from 1446. 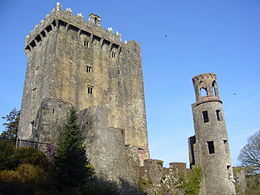 The Blarney Stone is built into the battlements. According to legend, kissing the stone endows the kisser with the gift of the gab (great eloquence or skill at flattery). This article uses material from the Wikipedia article "Blarney Castle", which is released under the Creative Commons Attribution-Share-Alike 3.0 License.